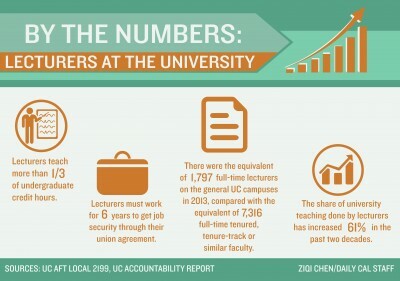 Lecturers throughout the UC system are teaching without a contract, as negotiations continue between their union and the university’s negotiation team. On Dec. 10, after 10 months of negotiations, the contract between the union — the University Council-American Federation of Teachers — and the UC system expired. The two parties are contending over lecturer’s benefits, salary increases, representation in the academic senate and the stability of appointments. The contract had previously been extended on two occasions: for a period of five months after a June negotiation session and until Dec. 10 after an October negotiation session. “Like those students who ‘try really hard’ but end up turning in only the first three pages of their required seven-page research paper, the UC couldn’t write up its positions by Wednesday afternoon,” said chief negotiator and UC Riverside lecturer Benjamin Harder in a blog post on the UC-AFT’s website, regarding the expiration of the contract. The contract, which is officially a memorandum of understanding — a form of agreement — establishes all provisions of a lecturer’s employment at the university such as salary, benefits and reappointment processes. Harder said that the bargaining team made the decision not to temporarily extend the contract for the third time because the university was not responding to its proposals quickly enough. Although the contract expired, all individual teaching contracts, along with with most provisions of the contract, continue to be in effect due to status quo provisions. The clause prohibiting the union from striking is no longer in effect, which means that, if certain criteria are met, they could strike. For example, if the university committed an unfair labor practice such as refusing to meet, the union would be able strike under state law. While McIver called a work stoppage a “last resort,” she did say that if the university did not “settle the contract quickly and fairly,” they would consider a grading strike. The lecturers would still grade courses, but would withhold the grades as a bargaining tool. Harder, who also ruled out a strike in the immediate future, said to expect more union activity in the form of lobbying legislators and holding demonstrations. 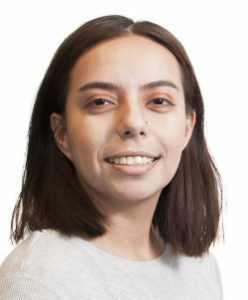 UC Office of the President spokesperson Kate Moser said that the university is “ready, willing and able to meet in good faith” with the union. While Moser hoped that an agreement would be reached by the end of the month, she said that in the event of an impasse, a strike would come after a number of steps. The potential for a strike is limited under the Higher Education Employer-Employee Relations Act. “If we were to reach an impasse, the university and the AFT would take part in the required procedures — including mediation and fact-finding — before a strike could be called,” Moser said in an email. 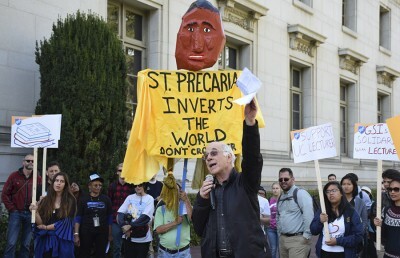 This is the largest labor dispute between the UC-AFT and the university since their three-year-long dispute ending in 2003. In that dispute, the lecturers gained the right to have a third-party arbitrator settle lecturers’ grievances with the union, as well a new system of continuing appointments guaranteeing that after a six-year period, without extenuating circumstances, a lecturer will maintain a teaching position at the university. Previously, the most job security a lecturer could have was a three-year appointment, according to Harder. According to Harder, lecturers worked without contracts for two calendar years during the negotiations. 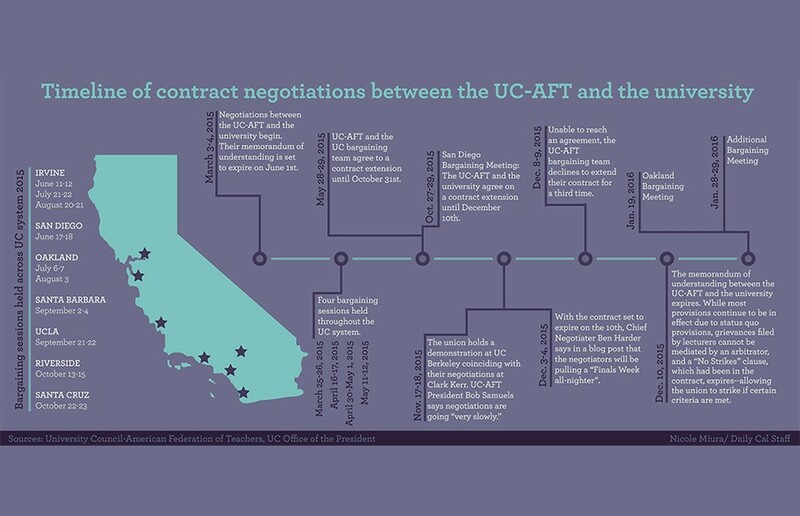 The UC-AFT bargaining team and the university’s bargaining team will meet Tuesday at the UCOP offices in Oakland. McIver said that while she hopes the meeting is productive, she doesn’t anticipate a resolution at Tuesday’s meeting, accusing the university of utilizing delaying tactics, such as postponing the beginning of meetings and arriving unprepared to meetings. Austin Weinstein covers academics and administration. Contact him at [email protected] and follow him on Twitter at @aweinstein5.